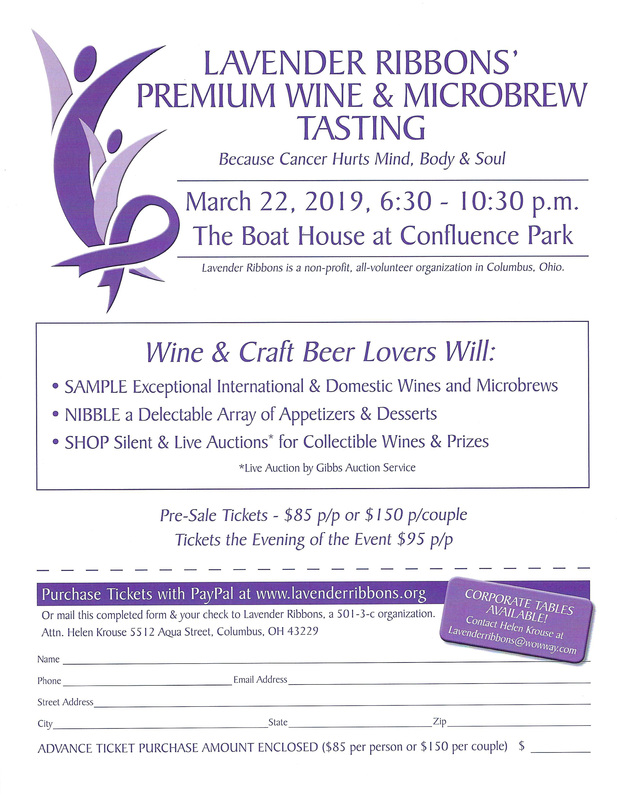 You can help us continue our mission by supporting our 16th annual Premium Wine Tasting fundraiser, which will take place Friday, March 22, 2019 at The Boat House @ Confluence Park. The event features a wide variety of premium wines, microbrews and an array of appetizers. Silent and live auctions will highlight the evening’s festivities making this an event you won’t want to miss. *Making a tax-deductible contribution to Lavender Ribbons, Inc.
* Company logo (if provided) will be placed in event program. Your logo must be submitted electronically or as camera ready artwork as outlined on the return form by March 8, 2019. See attached form for details. * A tax deduction for your donation (Lavender Ribbons, Inc. is a 501 (3) (c) organization) We anticipate that more than 150 people, including business and community leaders, physicians, medical specialists, and volunteers will attend this year’s event. Please consider this excellent way for you and your business to show support for children and adults coping with cancer in our community.